The accelerating momentum in plastics machinery demand that emerged in the second half of 2013 was sustained through the first half of this year, according to statistics released by the Committee on Equipment Statistics (CES) of SPI: The Plastics Industry Trade Association. Exports of primary plastics equipment, including injection molding, extrusion, blow molding and thermoforming equipment, for reporting companies totaled an estimated US$299.3 million in the second quarter of 2014. It was slightly lower than the US$300.3 million recorded in the first quarter of this year, but still represented a 10% year-on-year (YOY) growth. 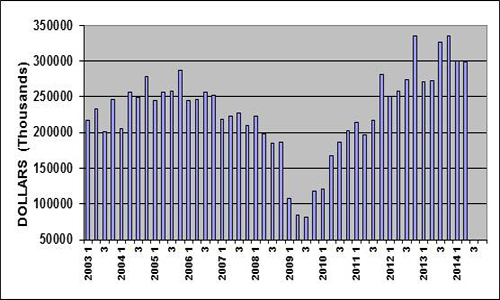 Export values of US injection molding machinery increased 9% in the second quarter of 2014 compared to the same period of last year. Meanwhile, the value of shipments of twin-screw extruders jumped 63% YOY. New bookings of auxiliary equipment for reporting companies totaled a record-breaking US$108.0 million in the second quarter of 2014, representing a spike upward of 21% over the same quarter in 2013. According to the second survey conducted by CES, the majority of plastics machinery suppliers believed that a widespread decline in demand is not yet in sight. 90% of the respondents expect conditions to stay the same or even improve in the coming quarter, and 88% expect them to hold steady or get better during the next 12 months. 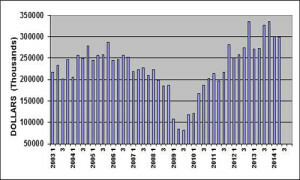 The consensus, CES said, is that North America will show the strongest growth. Expectations for Latin America and Mexico declined when compared with the responses from last quarter. Expectations for Asia and Europe improved. As for the major end-markets, the respondents to the quarterly survey expect that automotive and medical will remain strong in terms of demand for plastics products and equipment. Expectations for the other major end- markets call for mostly steady conditions in the coming year.